That’s why when Americans travel, they take American Tourister bags along for the ride! For generations, Americans have trusted this luggage name – and with the arrival of American Tourister here in Australia, there’s no need for us Aussies to miss out on all the fun. Bold, built to last and bigger than Texas, it’ll change the way you travel. With its eye-catching concentric circle design, the Curio collection is American Tourister’s most stylish range to date and now comes includes a versatile soft sided format. Boasting a tough polyester construction, the soft sided version of Curio still features the fantastic expandable design, allowing you to increase your packing space in seconds. With four double-spinner wheels and an extendable trolley handle, Curio’s soft sided luggage also boasts a handy zippered front compartment so you can access your essentials quickly. "Rippled" concentric circle design on front panel reduces the appearance of scuffs. 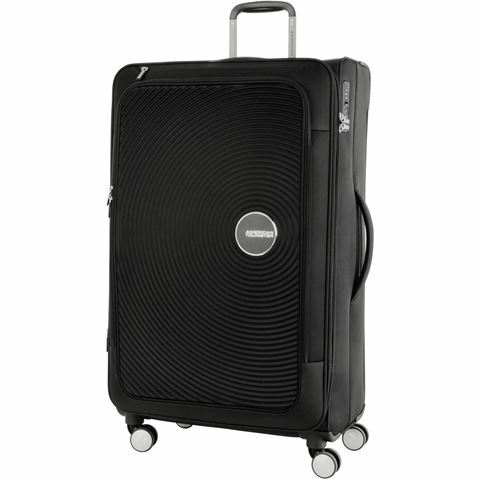 Lightweight adjustable aluminum trolley handle lets you move around airports in total comfort. Four 360 degree double-spinner wheels, so you can push or pull your luggage in any direction. Main compartment includes a zippered curtain, allowing you to keep your luggage organised as you travel. Zippered curtain features two zippered mesh pockets. Set of elastic packing straps to help you make the most of your packing space. Zippered front compartment opens accordion-style for easy access. Discreet zippered stash pocket located at the top of the case. An inbuilt TSA-compatible combination lock secures the main compartment. A TSA lock works in exactly the same way as a normal padlock, but when you travel in America, it allows security staff at airports to open your bags should they need to inspect them, without the need to damage your padlock or your bag. External Dimensions: 51cm (l) x 81cm (h) x 32/33cm (w).